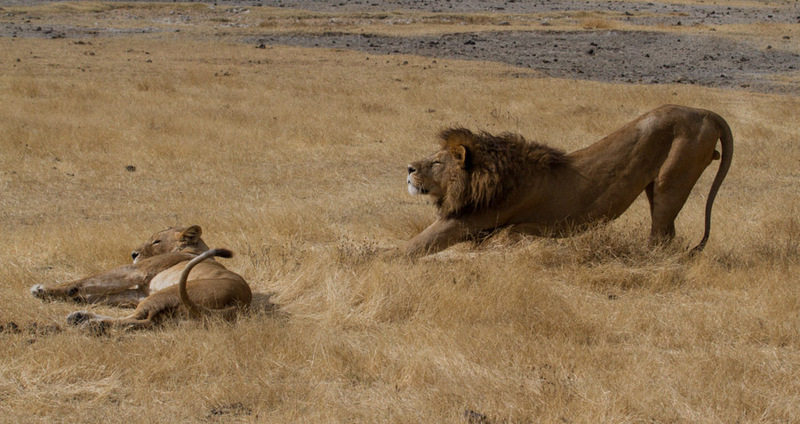 When a lioness comes into estrus and is ready to mate, she and the pride’s dominant male will engage in a week-long love fest of sorts. Judging from the state of the royal couple we encountered, it just might have been Day 7 of their tryst. The two lovers looked exhausted, and the male had clearly let personal hygiene fall by the wayside. It was obvious that they weren’t enjoying each other’s company anymore, and they panted heavily as they rested between love sessions. When the poor female tried to put some space between herself and her suitor, he sprung into action and chased her down to consummate their relationship yet again. The loud growls and snarls of the lioness made her displeasure obvious to all of us who were watching, engrossed in this amazing spectacle. Her oblivious suitor was not getting the hint that enough was enough—this lioness had one severe headache, and he just wasn’t going away. It was definitely a trip highlight for us. Very funny, indeed! Wow, you are making a lot of very nice holiday’s. can you send me your mail adress? Please? Hi Maritska! We’ll be in touch via email soon. Thanks for following along! Great story! Makes me want to travel out there! Thank you. You should. If you love seeing wildlife, you won’t regret it!